To schedule conference rooms, poster printing, building repairs/services, software installation, and more (EOHSI-Internal login required). 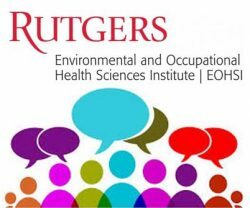 Click here for RUTGERS CONNECT resources and FAQs. Please have your powerpoint poster file in its final format when submitting it for printing. Also remember to have your file ready before submitting a work order because poster work orders without the files attached WILL NOT be printed on time. Before you purchase any computer equipment such as PC’s, printers and laptops, please contact ENS. We will work with you to make sure you get equipment that will be best suited to your needs and that will function in the EOHSI computer environment. ENS will provide you with recommendations, specifications and help you get price quotes. ENS can often get special education, state or volume discounts from our vendors. For assistance with hardware purchases please contact ENS at 5-4159, or use the OnLine Workorder #4 (Request for a Quote). When purchasing computer systems or printers you must send a copy of your purchase order to ENS. ENS is currently recommending products by Apple, Dell, and Lenovo. Contact ENS to discuss recommendations for desktops, laptops, printers, and peripherals. If you need to purchase other software programs ENS can assist you with price quotes for the latest software versions. ENS can often get special education, state or volume discounts. For assistance with software purchases please contact Mario Rodriguez ay 5-4159 or fill out a quote request from the network services menu. Use this PDF document to guide you to move your email off the email server and on to your desktop computer. You then have a “pst” file to copy to your flash drive for backup. If you have any questions please contact ENS at 848-445-4159. These manuals are available for users to borrow. See Maria to sign out books. If you are not the poster owner (i.e. if you are a supervisor who is submitting this request for a student) then please have the poster owner review this page. Use .jpeg and .gif images on your poster. We cannot guarantee the quality of other image format types. Avoid importing data to your poster (i.e. excel graphs, word documents, charts etc.). These types of data, when imported, have been a source of alignment and spacing problems once poster printing has begun. Have your poster saved in a PowerPoint slide (.ppt or .pptx format). Make sure that your poster is in its final revision format (we will print out a draft in black and white if you would like to see your poster in scale before making final revisions). EOHSI Network Access Form in PDF format. Download this form to request an account to store your files on the file server and create an e-mail account. EOHSI Directory Update Form in PDF format. Download this form to be added to the EOHSI On-Line Directory, Directory Booklet, and to able to put in Online Work Orders, request ENS equipment and EOHSI conference rooms. EOHSI Building Access Form in PDF format. Download this form to request off-hour access to the EOHSI building or access to EOHSI common equipment rooms. Page last updated by EOHSI Network Services at 3:10 pm November 27, 2018. This page was printed from eohsi.rutgers.edu/internal/ on Sunday, April 21, 2019.